1-Simply click on the "buy" icon at the right bottom of the image you wish to purchase. 2-You will be given a choice of either "This Photo", or " Photos in this Gallery", click on the appropriate choice. 3-A window will open showing the image you wish to purchase and, in the upper right, an icon/window indicating Paper Prints, along with sizing options, will appear . 4-Select the sizing option you prefer. Then simply choose the size best suited for the image you are purchasing. You can play with these sizing options to find the best print size for the image you've selected. 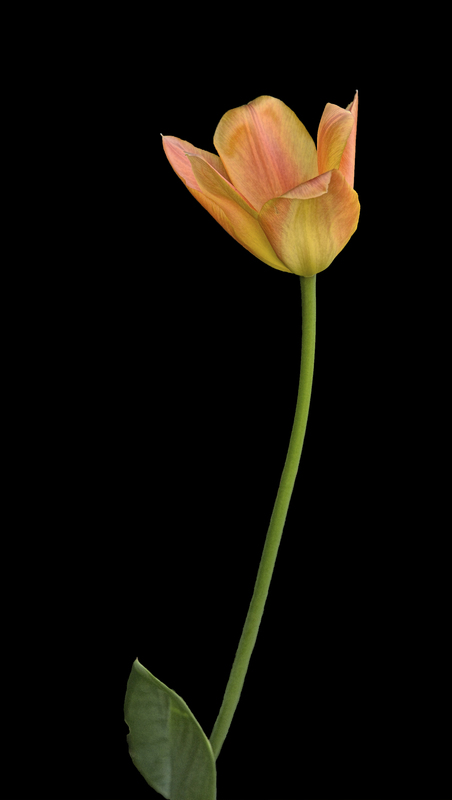 For Example: The image to the left,"Singular Tulip" is a bit of an odd size, so I would choose Other Sizes. Scrolling down that Size Box, click on 10X18 and the crop box appearing on the image shows it to be fully captured. That would be the size you would choose. You could also click on Panoramic Sizes and choose 5"X10", if you wished a smaller size, but the crop box that appears shows that a small portion of the image will be lost. Holding the mouse down over the box allows you to move it right or left, or up or down to best determine how you'd like the image to fit in the print size. At this point the decision is yours. 5-Now that you've determined the size simply select the paper you wish to have the image printed on. Clicking on the paper type takes you to another window which explains the properties of that particular paper. Click on "See More" for additional information. If you are satisfied with your choice simply click, "Add to Cart". The next window tells you that an item has been added to your cart. You may close the window to continue browsing, or click on,"View Cart to check out. 6-The "Check Out"window provides you with the final order information and another opportunity to recrop the image. At this point, if you are satisfied, click on ,"Check out" or "Check Out with PayPal". The rest has to do within shipping options, addresses, etc. A watermark is a copyright indication that appears on the face of the image while viewing it. This will never appear on prints that you purchase. A printmark is the equivalent of a signature that could appear on the front lower portion of an image identifying the artist. As of this writing my copyright info will appear on the back of a print and not on the front, giving you a completely clean print. INTERESTED IN METAL PRINTS OR STRETCHED CANVAS PRINTS? Please contact me directly via the contact button at the top of any page .